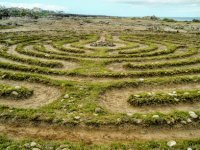 26 labyrinths found. Showing 1-20. Sorted by country, state, city, then zip/postal code. 20 N° Lat. ; 155 W° Long. Please call for directions to Sanctuary. 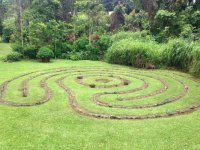 Located at our retreat center in North Kohala on the Big Island of Hawaii. 20 23° Lat. ; 155 83° Long. 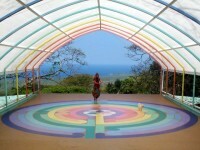 Dragonfly Ranch Rainbow Labyrinth over looking Kona Coast. 1 1/2 miles down city of refuge road. signs out front. The Labyrinth at St. Clement's is patterned after the 11-circuit labyrinth of Chartres Cathedral in France and was installed in March 2006. Over 42 feet in diameter, a complete circuit from entrance to exit is 1/3 of a mile. Frequently cars parked over it during the day. 89 mile marker, Mauka of Milolii, in Honomalino Acres. From historic Lahaina town take HW 30 north to "Hobbitland". At mile marker 38, park seaside near the orange gate, walk down toward the ocean and voila! 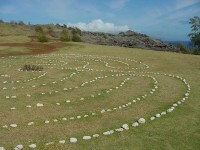 Labyrinth is on south side of Queen Emma Community Center above historic Christ Church. "The Pathway to the God"
Muaisa Hale Pule ("As I Aum" Sanctuary) is an authorized Chapter of New Haven Native American Church. Nestled on the slopes of Mauna Loa in a place of rejuvenation that the ancients knew as "The Pathway to the God," we are located just 11 miles south of Kailua-Kona above mile marker 111 on Highway 11. 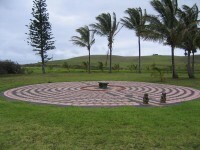 Our labyrinth sits directly atop the stargate portal of 19.5 degrees North latitude. According to sacred geometry, this unique place is said to be on one of Earth's 10 major vortices and to align with the "merkaba" (light body) of the planet. Prayers and intentions made here are broadcast to the Earth and beyond. Off the main drag at 1600 ft elevation, the property is surrounded by ranch land and infused with the pristine majesty of the island and with the Spirit of Aloha. Lodging, vision quests and shamanic programs are available on a suggested donation basis. Open year round by appointment. Please contact us for an appointment or for reservations prior to the time you wish to join us. A hui hou (Till we meet)! Between mile markers 16 & 17 oceanside on Highway 37 in Kula - upcountry! All walks have short talk in church at 7:30pm, followed by walk, then fellowship. always open, if school is in session, please sign in with the school secretary in the office. If you would like a Guided walk, the 7th graders are happy to walk w/you depending on their schedule. ID#5640 Hoku Nui Maui, LLC. 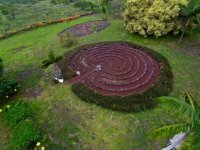 Labyrinth is being designed for Hoku Nui Maui, a sustainable community, permaculture design, native forest, food forests, farmers' market for our organic products and food and value-added items. Call for progress updates and availability. From the airport: Turn left onto the Hana Highway (36). Right on the Haleakala Highway (37). Go four miles up and turn left on Haliimaile Rd. and take it all the way to the end. Turn right at the stop sign on Baldwin Ave. Take the first left on Kaluanui Rd., one mile and you are there! This is an 11-circuit, Chartres style, with an open heart at the center rather than that rosette. It is in a beautiful, tropical setting on Maui, next to a stream. We are just two miles below Makawao Town and about 5 miles above Paia Town, off of Baldwin Ave. 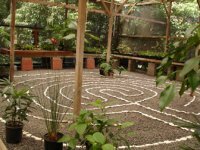 The labyrinth, located inside of a stunningly beautiful greenhouse/nursery/healing sanctuary is open daily from 10am to 5pm free to the public and by scheduled event or appointment. 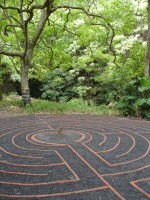 We also have an outdoor medieval (11-circuit) labyrinth on the property. From Hwy 137 (Red Road), go mauka (uphill, towards the mountains) on Mapuana Ave in the neighborhood of Kalapana Seaview Estates. Go .8 mile and turn left on Puulena Street. The Puulena Labyrinth is on the right, after three houses. It occupies an entire lot, has a portal and steps leading up to it. Observe silence at all times, please. Observe silence at all times, especially in groups.